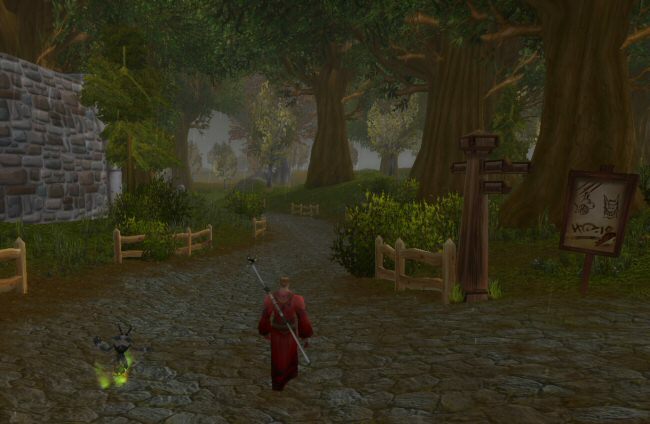 On the edge of Elwynn forest we come to a garrison. "Maybe we should see if they have any jobs posted," Norman mutters to himself. "You know, before we leave Elwynn for good." 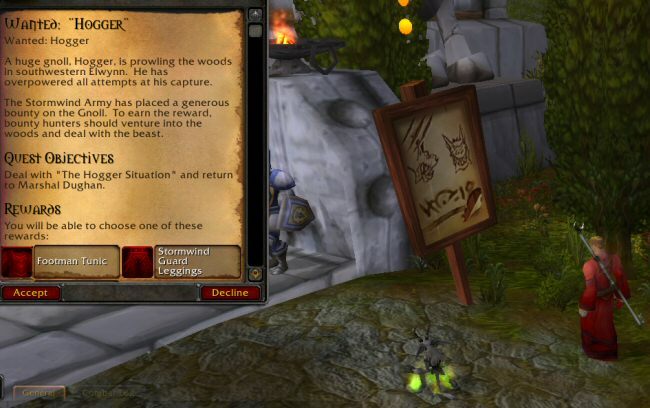 Interesting note is that this quest is marked as a [group] quest in your quest log, but the quest description doesn't say anything about it being a group job or suggest what size group you should have. Looks like a regular old solo quest if you read the description. Kind of odd. Still, Hogger is a handful and taking him on solo would be very foolish. "Looks good, we'll do it," Norman says. "What's a Gnoll?" I ask. "Erm. I think it's kinda like a pig-man," Norman says. "They're not too dangerous. They're only about waist high." We plunge into the forest and slaughter our way to Hogger's camp. It turns out he's a good bit taller than "waist high". "He's very large," Norman says nervously. "Ah well, I'm sure the guards wouldn't have posted it if it was too big a job." 1) He sets Hogger on fire. 2) I distract Hogger with a fireball. 3) Norman begins rending Hogger with tendrils of malignant shadow magic. 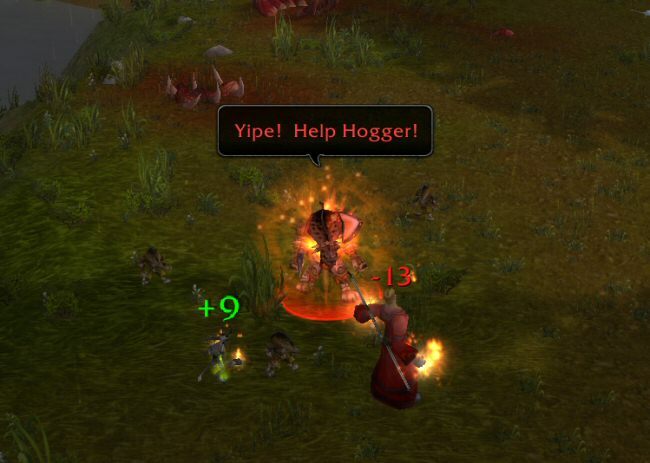 4) I continue to confuse Hogger with fireballs. 5) Norman heals himself by draining away the last of Hogger's life energy. 1) Hogger runs over and begins stabbing Norman. 2) Norman closes his eyes and swings his staff around while making little-girl noises. Somehow Hogger gets slightly injured by this process. So he calls for help. So now we have a little cluster of tiny Hoglings to fight. Things start to look grim. I won't get credit for Norman if he dies before turning to evil, and I'd hate to see all of my half-assed efforts go to waste.